Nene Valley signed off their cross-country season with a set of fine performances in the Inter-Counties Championships at Loughborough on Saturday (writes Barry Warne). Several Nene Valley athletes made the top 100 in their races with the light blue vested Lloyd Kempson 80th and 19 year-old Lincolnshire runner James McCrae 101st in the senior men’s race. A quartet of Under 20 Lincolnshire men were led home by Alex Hampson, who finished 73rd. Niam Payne placed 96th while Bradley Spurdens and Austin Herbert were 128th and 129th respectively. In the Under 13 races Sam Oakley battled his way through the field after a slow start to finish 80th for Cambs, while team-mate Lottie Hemmings took 191st place. Three Nene Valley Under 17 men ran for Lincolnshire with Aaron Hunt the pick of the bunch in 167th. Bradley Allan crossed the line 227th ahead of Nandeli Palembi 225th. Lincolnshire’s Matt Dowling was 213th Under 15 with team-mate Hana Ray 238th in the girls race sandwiched between the Cambridgeshire pair of Molly Jones 196th and 244th-placed Katie Tasker. Ruth Jones was the sole Nene Valley runner in the senior ladies’ race finishing 204th in Lincolnshire colours. 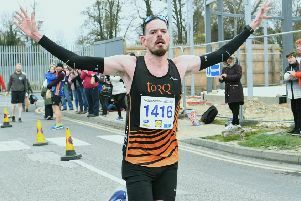 n On the road Nene Valley Harrier Chris Wright enjoyed a fine run in the North London Half-Marathon finishing seventh in 1:11.51, and Yvonne Scarrott finished second Over 45 in the Retford Half-Marathon.